As Blackboard faces upgrading and the procurement process grinds on, Getting Started offers its annual overview of the ways the VLE is used across the university. On a scale from good, less good to not at all. Getting Started has always had differential levels of participation. I believe the disparity has less to do with attitudes to transition and is more a reflection of the way Blackboard is used across individual practice. As a T&L Coordinator supporting the use of technology, the gaps suggest I’m not doing a very good job. My current downer on all things virtual continues. Students like their VLE but workshops and surveys suggest differential use between modules and courses is an increasing cause for concern. The question of minimum standards has been mooted although how this would be mandated or policed is less clear. I get despondent over exclusive practices, but there are bigger issues around initial engagement in the first place. Feenberg * may be right. The technology has failed. As Laurillard ** says we are on the brink of transformation – but have been there for some time. Maybe if we took the technology away? My MA in Open and Distance Learning with the OU was delivered online. Four of six modules used a variety of tools and assessment activities. I chose the last two from social science. Resources were delivered in traditional distance learning style; cardboard boxes full of cds and books. No online element – not even a discussion. Assignments were posted and returned hand marked. This was not long ago. I learned as much about the affordances of technology to enhance learning, and the power of online communities of shared practice to create new knowledge, by their absence as their presence. Getting Started is a useful snapshot of VLE engagement. I call for inclusive practice but if Blackboard is not being used, or is a holding place for a collection of Word documents, conversation around TechDis Accessibility Essentials or the DDA/Equality Act is doomed. The gap between my conception of virtual learning and the reality of a VLE as a repository for Word and PowerPoint requires rethinking. Discussions around the Digital Education Strategy need to focus on the low end-user and non-user. Pushing up to blue skies will not address resistance. Is resistance to Blackboard political or personal? Is it indicative of broader attitudes to internet enabled communication and information? You may as well ask if exclusive practice is deliberate or inadvertent? No one intentionally sets out to exclude. There is innovative and exciting use of Blackboard across the university but they remain in pockets. The problem with technology is the divide between those advocating use and those who are the users. The digital divide has less to do with access and more the way access is managed and the continual problem of content being presented in single formats based on assumptions the user can access it. I don’t have the answer in the present economic climate. All I know is in their relationship with technology, people will find their own level and stay there. It might not be effective or inclusive – but without increased human resource and ring fenced funding to support change – the current situation of good, less good or not at all is probably about as good as it gets. Screech, scratch, scrape – this is the sound of the soap box being dragged out again. For years I’ve been a lonely voice for digitally inclusive practice. Advocating the TechdDis Accessibility Essential series for making electronic documents more readable http://www.jisctechdis.ac.uk/techdis/resources/ae Supporting the principles of inclusive practice as improving access for all. In the beginning I’d be encouraged by all the ‘I never thought of that’ comments but recently I’ve begun to feel a failure – because nothing’s changed. Here is an opportunity to give the soapbox centre stage on a validated teacher education programme. My phd is moving towards the inclusive practice aspect of digital literacies and scholarship with the opportunity to develop a participatory action research project on, in and around the subject of digital inclusion. But on the outside nothing’s changed. The editorial from the Journal Research in Learning Technology’s special edition on digital inclusion (Vol 20 2012 available free online http://www.researchinlearningtechnology.net/index.php/rlt/issue/view/1432) starts optimistically. It identifies how ‘current digital inclusion research has failed to produce a detailed critique of what constitutes empowering support from educational institutions and their staff’. How the ‘lack of open and reflexive accounts of practice’ is hindering identification and understanding of the ‘essential empowering practices’ which are so necessary for challenging the prejudice, stereotypes and risk-aversiveness – all of which contributes to digital exclusion. Here is the language of my sessions with staff and students on the values and ethics of a digital society but the ultimately the Journal only points out old problems and suggesting new solutions – calling for a ‘bolder approach’ by policy makers and funding agencies – precisely because so far nothing has changed! The reason for this blog is the UL HR elearning packages. It got off to a bad start with the image on the Portal page https://portal.lincoln.ac.uk/C11/C0/Online%20Training/default.aspx Here is an example about nothing changing. Text over images is never good practice – especially when advertising ‘e-learning! 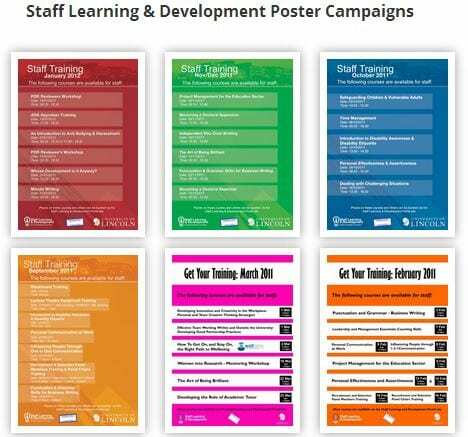 Looking at the Staff Learning and Development Poster page http://posters.lincoln.ac.uk/group/sld it seems this one slipped through – or looking at the dates on the poster archive page – may be the sign of things to come. Could I suggest the use fo text over images quietly slips out again or the new designer visits http://odi.dwp.gov.uk/inclusive-communications/channels/publishing.php for some useful guidance on creating accessible posters. My sense of failure was heightened with the new e-learning package Bribery Act &/and Anti Money Laundering (I hate ampersands!) Faced with the question of taking time to highlight the issues or ignoring them – I decided to take time out to climb on the lonely soapbox and register another solitary protest. MOOCs are great on so many levels. It’s hard to know where to start but already its’ clear that prioritising and organisation are key to MOOC success. How the tutors are managing to keep up with all the postings I don’t know; possibly lots of caffeine and late nights/early mornings lie ahead. A key challenge is the proliferation of places to work in. It’s early days on the OLDs MOOC but already there is additional email traffic to manage and multiple new online places to explore (Cloudworks, Google Groups, Bibsomony etc). The summary of all the blog posts which mention MOOCs is a neat example of how the internet draws together shared interest. But is it all too much? Digital confidence directly relates to existing experience – in particular with finding your way around social networking platforms – for participants new to working online this in itself may pose a barrier. When it comes to online presence, I prefer less to more – like single sign-on in reverse – one post appears in multiple places. I would be interested to know how other people manage their online lives and have posted this question in google groups – or was it my cloud in cloudworks? I’ve had so many MOOC windows I was getting confused. Friday activities included View and discuss the presentation introducing learning design for the OLDS MOOC. Somewhere I saw an instruction not to start a new thread but couldn’t find where I’d read it.. There didn’t seem to be one which fitted the instruction. It all got a bit messy. Is OLDs MOOC is using reverse psychology where having a proliferation of places to post is showing less is best? Or an example of technology dominating the pedagogy and/or the user experience. OLD is open ended – there are always new tools and new ways of using them so by definition OLD can never be finished – but in terms of learning design there is a risk the practice gets lost in the process. For me, learning design has to focus on the affordances of the software and keep the interface simple. As tweeted on #oldsmooc this is a learning curve on massiveness. My response to Friday’s activity was to comment on the use of automatic captions on the YouTube presentation at http://www.youtube.com/watch?v=Gc9u91y0RJ0&list=PLmkRbbm6LeNWQl3AgFP2eKE1akOeN1jfB They are inaccurate and difficult to read. The use of Multimedia in learning design offers powerful opportunities for meeting a range of learning preferences but all too often the provision of that information is limited to single or inadequate formats. 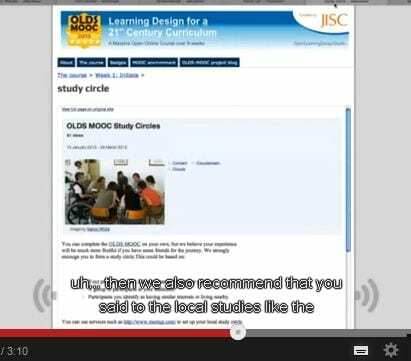 It would be good to see OLDs MOOC following JISC TechDis advice on inclusive practice and setting an exemplary example with audio and video for others to follow. Digital data’s inherent flexibility to support a diverse range of access requirements has long been promoted. TechDis and Dyslexia Friendly Text from the British Dyslexia Association have offered a range of alternatives but there has been no one size fits all solution. OpenDyslexic attempts to overcome this. It reflects how ebook readers are making digital the choice of text for many users while also supporting the philosophy and practice of openness. The font has bottom-weighted characters, designed to reduce letter-swapping and increase the differentiation between similar-looking letters. this may improve readability not just for people with dyslexia but those with low vision might also find this font useful with large chunks of text. Within 24 hours I’ve had not one but two encounters with accessibility issues. Both demonstrated negativity towards the concepts of reasonable adjustment and alternative versions in relation to teaching and learning resources. This is my resulting rant and reflection – please check out the links at the end. You just never know, one day the thread of your reality may be cut without warning! Some background: ten years ago I worked in community education and set up a number of computer training rooms for people with disabilities; the work was funded with short term project grants – which is indicative of the reality for the socially disabled – where support and training is dependent on charities and the kindness of strangers. I am continually reminded that the situation with regard to respect and consideration cannot be said to have significantly improved over the past decade. Why is this relevant here? Well, as a public institution, the University of Lincoln has a duty to ensure it can demonstrate proactivity in anticipating barriers to access. However, a recognised need to be inclusive is not enough to ensure institutional change. Across the HE sector, disability support units are rarely integrated into teaching and learning units and the locus of disability awareness continues to exist on the periphery. For me accessibility is about removing barriers to participation and engagement. That means a holistic attitude towards the creation of accessible content. It’s not something that can be bolted on either as an afterthought or because someone has had to request an alternative version. Staff should also visit Accessibility in Learning produced by JISC and TechDis in conjuction with the Quality Improvement Agency (QIA). This new online resource looks at eight categories of users; those who have difficulty seeing, hearing, understanding, concentrating, manipulating things, communicating with others, accessing text and who are dyslexic – and provides practical guidelines practical guidelines for making learning materials more accessible. The information is out there; the responsiblity for acting on it is down to the individual. If you still need convincing read some of these accounts from students accessing higher education. Go to ALERT (University of Bournemouth) and DART (Loughborough University) and the most recent JISC funded research at LExDis (University of Southampton) to sample the student experience first hand.